TV show dates: December 18, 2017 — present. Performers include: Ellen DeGeneres (host). Hosted by DeGeneres, who also executive produces, the Ellen’s Game of Games TV show is a reality TV series competition, featuring games from her daytime talk show, The Ellen DeGeneres Show. Contestants are plucked from the studio audience for the chance to compete for sizable cash prizes. Competitors on the game show must overcome obstacles, answer timed questions, and try their hands at “Blindfolded Musical Chairs,” “Dizzy Dash,” and “Scary Go Round,” as well as other contests. The fun and games unfold over four rounds of play. To advance to play “Know or Go,” a player must win in a given round. The contestant who makes it all the way to the final round ultimately gets the chance to play “Hot Hands,” in which they have to supply correct answers to questions in a set amount of time. What do you think? Do you like the Ellen’s Game of Games TV series? Should this TV show be cancelled or renewed for another season on NBC? 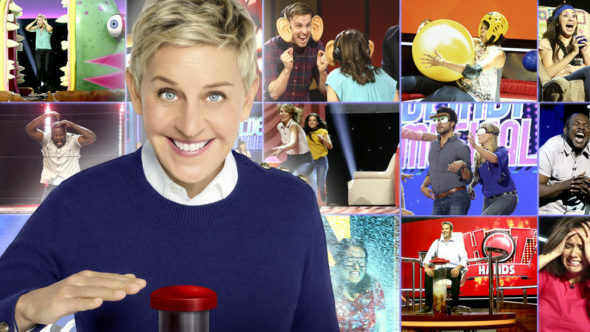 More about: Ellen's Game of Games, Ellen's Game of Games: canceled or renewed?, Ellen's Game of Games: ratings, NBC TV shows: canceled or renewed? It should definitely be renewed? Wow!!! I don’t really watch game shows but I think Ellen has a winner here. I laughed so hard and was entertained!!! I laughed for an entire hour….fun game show and Ellen makes it all the more enjoyable! PLZ RENEW THIS SHOW! It is very entertaining and makes me laugh outloud. MORE ELLEN’S GAME OF GAMES STAT!